We all fear data loss scenarios, be it due to software malfunction or malware/virus attack or sudden crashing of OS may lead to data loss and many more. The first point of action, if any such situation has occurred to you, would be to seek help of a reliable Android data recovery software. Thereby, we have collated some of the best Android data recovery software that can effectively help you to recover your data back. Let's discover them now! When you are scouting for the best Android data recovery software, how could you miss Tenorshare Android Data Recovery. This reliable desktop tool can possibly recover any lost data from your Android phone including contacts, photos, videos, messages etc. whether you have lost the data dues to factory reset, accidentally deleted, water damaged, OS got crashed, or rooting, this tool can recover it with the highest recovery rate. It can selectively recover data from your device or SD card. You also get to preview the data prior to recovering it. It supports 2000 plus Android devices for safely recovering data. 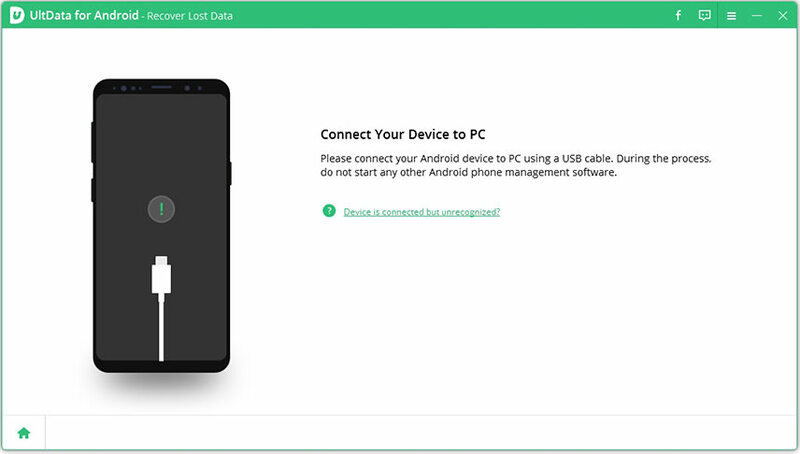 Step 1: Download and install Tenorshare Android Data Recovery software on your computer. Launch it as soon as the installation process gets over. Using a USB cable, connect your Android device with the computer. Step 2: Now, a list of files will be displayed on screen. Check the data you want to recover and then hit the 'Next' button afterwards. All the device data gets scanned now. Note: You may need to allow USB debugging on your Android phone. For that, follow the onscreen instructions right after the Android device is connected to the computer. A window pops up asking for 'Allow USB Debugging' after detecting your device, click 'OK'. Step 3: Now, you need to preview the data by selecting the file type from the left pane. Once you tap the 'Show All' tab and from the drop down choose 'Only display the deleted items', click on the data type from the left panel. Step 4: Select the desired files from the list and then hit 'Recover', for saving them to your computer. Media files are saved in their original formats but messages, contacts and call history are saved in Excel, XML or Text documents. Now, we have another Android data recovery tool called PhoneRescue to recover data from your Android mobile and tablets. This tool can retrieve a wide range of data including photos, messages, contacts and everything else from your Android device. You can even directly restore the lost data to your Android device using this software. It has highest success rate for recovering data and can locate hidden data from your device with or without rooting it. Moreover, it can also help you in restoring certain app data and attachments, such as WhatsApp. dr.fone Recover (Android Data Recovery) software is another option with high recovery rate in the industry. You can recover videos, photos, messages, call logs etc. using this software. It can recover data from 6000 plus Android device models across manufacturers. If you have a broken Samsung phone, it can extract data from there too. In case you forgot password, the system got crashed, deleted data, SD card got issues, a flashing ROM, rooting error, damage, screen went black, or the phone is not responding, then also this software can easily retrieve your data. It supports Mac and Windows PCs. Software tools like this are reliable than any Android data recovery app. Using this software, you can restore deleted device data from your phone memory as well as SD card. Most leading brands of Android devices are supported by this application. It is capable of recovering contacts, messages, photos, music, videos, Viber, WhatsApp etc. FonePaw Android Data Recovery tool can get back your lost data with a simple click. It scans the deleted data from your device faster. While recovering your data, it ensures protecting the existing data. Preview of deleted data prior to recovering is possible without any issues. Whether you have lost device data due to accidental deletion, virus attack, rooting, OS crash or any other reason in that matter, it can restore it anyway. More than 6000 Android device models are supported by this tool. Even the SIM card or internal memory data gets recovered in VCF/CSV/HTML file formats. From the above article, we reached to this conclusion that Tenorshare Android Data Recovery tool is the best Android data recovery software among them all. It can not only recovers lost and deleted data, but also helps you do it selectively.